A thoughtful gift takes into account the recipient’s tastes, desires and personality. It doesn’t have to be a surprise. As both a writer and a skater, I’ve noticed that gifts for people who define themselves by profession or hobbies tend to be somewhat unimaginative. A necklace with a skate charm or a t-shirt with one of Shakespeare’s quotes makes a nice gift. It’s appreciated. But sometimes, I wish people would pay more attention to what we NEED. If you don’t know, ask. We are not shy about telling you what we lack. Paper / office supplies. Get your writer a gift card to Staples. I can run around in there for days. If someone gave me a fully loaded Staples card, I’d marry them. A good laser printer. This makes a great gift, if you can afford it. I splurged on a commercial grade one, but HP makes some decent home ones too. You can’t print a 400-page manuscript on an inkjet printer. You’ll kill it. A subscription to an online file storage site like Dropbox, Carbonite, or Mozy. IF YOU’RE NOT BACKING UP YOUR WORK, DO IT NOW! You can do it to an external drive or upload it into the cloud. These sites offer backup services that can do your whole system regularly for a nominal fee. It’s a small price to pay for peace of mind, in the event of a system failure or a clumsily-handled cup of coffee. Books. About writing, editing, or a gift card so we can pick out what we want. Most writers like to read also, so if you know who your writer’s favorite author is, pick up their latest. The newest edition of the Writer’s Market guide is a terrific present. Webinars and workshops. Professional development is important. Writers don’t often have a lot of money for workshops. Find out which ones they would like to attend and get them a ticket. Not all are expensive; Writer’s Digest has some online webinars for under $100. Computer accessories. Power supply, a laptop case, or a mobile broadband card. Time. Do some chores when your writer is working. Most of us have not quit our day jobs and might not be able to for a long time, so help us out. Take the kids to the park, do the dishes for us, field phone calls. Let us work uninterrupted for a while each day. It’s very hard to find time to write when you work and then must care for a family or household. Even writers without kids have a hard time of it, especially if they live alone and have no one to help them do yard work, etc. It’s a cheap gift, but one of the best. Check with your writer and see what they would like to receive for a birthday or Christmas gift. If you have any suggestions, please share them in the comments. Even more than writing, I love reading. This weekend, I devoured a new book by Dean Koontz, Relentless, a terrific thriller by one of the masters of the genre. I’d like to share a few thoughts about it with you. I haven’t read Koontz for a while, but coming back is like coming home. I used to be one of his biggest fans but for a while there, he seemed to have lost something. I suspect there was something serious going on but what it was I don’t know. I now have a ton of things to get caught up on. This man used to scare the crap out of me. I read Phantoms a long time ago and nearly peed myself. He hasn’t been able to scare me for a while (no one has), but in Relentless, there were a few parts that gave me chills. I wasn’t reading it at night; I was sitting in the waiting area at the car repair place! Relentless doesn’t hit the ground running like a lot of suspense thrillers. Koontz takes the time to introduce the small family—Cubby Greenwich, wife Penny Boom, son Milo and dog Lassie—with whom we’ll be spending the next 356 pages. Soon we care about them. They are funny, endearing, and intelligent. Cubby and Penny are writers. Ordinarily I can’t stand reading books about writers, or watching TV shows about people with their own TV shows. It’s all so meta, and fails at irony most of the time. Cubby, the narrator, is likeable and funny, so you don’t immediately think, “Oh, another writer writing about writers.” Both Milo and Lassie are unusual, nearly magical, and we know this will be important later. (It is.) The special canine is a trademark of Koontz, a longtime dog lover, used most effectively in Watchers. The premise is simple. An eminent but eccentric critic, Shearman Waxx, writes a scathing review of Cubby’s book. Cubby goes to the restaurant where the critic is having lunch to get a look at the man, and inadvertently, or so he thinks, irritates him. Waxx begins a campaign of terrorism against the writer. To survive, Cubby and his family must uncover the motives behind his bizarre behavior, while desperately running for their lives. Koontz tells the story in first person, which provides a tight, personal point of view and keeps the focus on what is most important to Cubby. It also serves to make the villain more enigmatic. Who is Shearman Waxx? Why is he doing what he’s doing? We never get inside his head, so we can’t know. He uses short, sharp paragraphs, many of them one-liners. Paragraph length is a personal style choice, and also one of pacing. Shorter paragraphs move the reader through the text quickly. He also favors long stretches of dialogue with no tags and you have to pay close attention to remember who is speaking. It’s a Koontz signature; I would know it was his writing even if he wrote under the name Hortense Bandicoot. When he gets to an important flashback, he changes tense (from past to present). The entire flashback has its own chapter and Koontz takes his time with it. These two techniques make a long flashback stand out. A shorter one is better incorporated into the scene in which it appears. Writers often do a quick tense change from past perfect (He had thought about it long and hard) to regular past tense to describe what is happening in the flashback (His hands trembled as he cocked the gun) and back to past perfect (It had been his defining moment) to indicate the transition back to the current events of the story. He plants several things and waters them with hints more than once, but holds revelation back until their significance can be both realized and utilized in the battle for survival. We think we know. We’re dying to see if we’re on the right track. Wisely, Koontz doesn’t explain everything but lets us find out as we go along. A classic suspense technique, it holds reader attention and allows for character development as Cubby’s situation changes. The supporting characters in Relentless are very cool; they have everything the pursued family needs when they need it. This seems very convenient, but most thrillers require a suspension of disbelief the same way horror, fantasy or sci-fi does. Scenes where the protagonists find or learn sophisticated survival techniques without any help would make the book too long. This genre is all about fast pacing. Certain things have to happen at the right time for the heroes to escape or win a battle. It’s better if they can pick up what they need as they go along, like characters in a video game. Koontz uses one device I don’t like, foreshadowing at the end of a chapter: “And we didn’t know then about the bad thing in the future.” Dan Brown gets criticized for this a lot. Personally, I find this device irritating; I’d much rather get to the bad thing and be surprised. Also, if I’ve gotten more than halfway through a book, chances are I’m going to finish. The writer doesn’t have to be so obvious about manipulating me to turn the page. A sociopathic villain chasing the protagonist has been done before. TONS of times. But Koontz has found a fresh twist here. So easy to do it the other way around; most writers would have the writer chasing the critic who gave him a bad review. Koontz turned it upside down. This is a great way to get a fresh perspective on a story. Since most or all stories are variations on the same few premises, it’s a good exercise to use. Sometimes you won’t find a twist this way, but you will find a more effective perspective on a scene or a whole book. For example, if you’re retelling a classic conflict such as an abusive marriage, switch sexes on the characters. Have the wife beating the husband (it happens, really). Change the POV to a supporting character, like Nick in The Great Gatsby, or the servant girl in Mary Reilly (a retelling of Dr. Jekyll and Mr. Hyde). Have that character tell the story instead, his/her insights or misunderstandings driving the narrative. I liked this book. I recommend it even if you’re not a Koontz fan. When I really get into a book, either I read it in two days or drag it out forever, depending on the length. This was a two-day book, not too long and not too short. It’s a good read for budding and experienced thriller writers and readers alike. Enjoy it if you get the chance. In an earlier post, I wrote about job interview questions, something I thought of while reading a humorous article online about what not to say in an interview. It made me think about writing when you have a day job and how tough that is. I haven’t talked to any other writers about this; I still don’t have a critique group at this time. There is one here I’m sort of interested in, but it meets when I have skating lessons. Between my lessons (which I can’t afford right now, dammit), working, taking care of chores, etc. and trying to keep up with all my peeps, it’s hard for me to get my daily allotted verbiage on the page. I can’t imagine doing it with a family. I have a lot of respect for people who do. I’m not the kind of person who can work two jobs, but that’s what I’m trying to do. Only I’m not getting paid for one (yet). Writing takes energy and it’s even more difficult when you’ve spent most of it at work. I found an excellent article here on keeping your focus on writing when you have a day job. It’s by a screenwriter named David Anaxagoras. Go ahead and read it; I’ll wait. Read it? Okay, he has one suggestion that I had to find out, somewhat painfully, on my own. In the section entitled “Remember who and what you are,” he says you have to disengage from the drama of your job and keep in mind that you are a writer, first and foremost. It’s just a job. You can still do it and do it well, but don’t let it take over and sap your energy. I had to do this to escape stress. After writing Rose’s Hostage, I took a break and realized how god-awful tired I was. It wasn’t because I was up every night until 11:30 writing then getting up at six to go to work. It was because I let the job get to me, let the stress of miscommunication and procrastination and all the other office drama ruin my day. When I got home, I had little or no energy left to write queries, do editing work or plan my next project. I was completely unfocused. I’ve been looking at ways to maximize my productivity and I’ve tried to use bits of time during the day that pop up occasionally. I’m lucky in that I work at a desk, and I can sneak in a blog post or a scene or two here and there when I have a little downtime. During Arlee Bird’s Alphabet Blog Challenge, I had editing to do at night and did the posts at lunch. It’s around forty-five minutes of useful time. I have to drag my laptop to work to write at lunch, but that’s how I wrote most of my book and will probably write the next ones until I either run screaming out the door or get my “big break.” At some point I’m going to spring for a netbook. Lugging my laptop around is getting kind of painful. I also carry a flash drive on a lanyard around my neck, and whenever I think of something I’d like to get down or make a note of, out it comes. By doing this, I feel connected to my writing during the day, something David suggests in his article. The flash drive is also a talisman for me; sometimes I find myself squeezing it, as though it were a religious medal or a lucky piece. If I get too frazzled or despair threatens, it helps ground me and remind me of my real work. I try to maintain a positive attitude about my work. I know that my chances of quitting my day job aren’t very good, but that doesn’t mean it will never happen. I have to just keep plugging away. As long as I’m doing it I’m learning and making myself a better writer. One of my grad school instructors told me that time spent writing is never wasted, no matter what I’m working on. She was right. Update – After a couple of weeks with the pool cover on (mostly), the birds have vacated the tree. Seems they really only wanted a toilet after all. We interrupt your regularly scheduled blogging to bring you a ranty message from Disgruntled Pool Owners of Missouri vs. 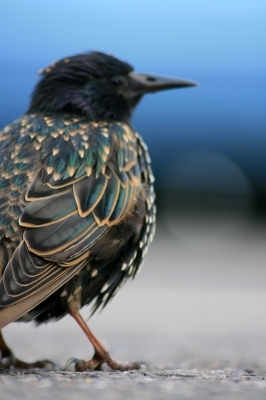 The European Starling! Normally, I like birds. 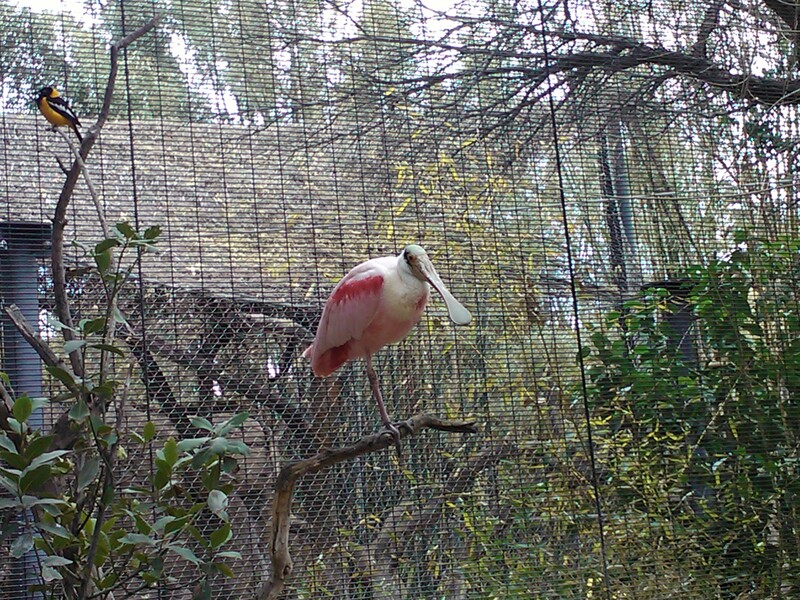 Flamingos, roseate spoonbills, eagles, doves, even pelicans have their charm. Well, maybe not; if you’re sitting on the beach when a flock of pelicans flies over, you might want to have an umbrella. But not starlings. In 1890, in New York City, someone who wanted to have all the birds mentioned in Shakespeare’s plays released a bunch of starlings, among other birds, in Central Park. I hate him and want to desecrate his grave. Remember the government stimulus checks everyone got a few years ago? I called them Dubya checks. With mine, I purchased several DVD sets of Looney Tunes and a 12×3-foot backyard pool. I don’t regret the DVDs in the least, but the pool is starting to get on my nerves. First of all, whatever genius built this Fifties tract neighborhood made the backyards (mine, anyway) from fill, with a thin layer of topsoil over it. And the entire yard slants toward the house. The soil is disgustingly fertile and so far, everything I’ve planted grows like a maniac. The weeds do too, unfortunately. Where to put the pool? I couldn’t put it on my patio, because it would be in the sun the entire day. I’d tried that already with a smaller, inflatable pool and it just wasn’t an ideal location. I don’t like hot pool water, or sunburns. My neighbor to the west has a beautiful, tall linden tree in her yard, whose shadow cools the far south end of my yard during the afternoon. A perfect spot. A few leaves were no big deal. I attempted to dig out a large flat circle and level the yard a bit, to put the pool down. No dice. With all the rocks, I just couldn’t do that effectively. So the pool leans a bit. No biggie. I can deal. The water stays level, after all. I have no outside outlet, so I have to run the pump off an extension cord. Also no biggie. I would just do that once a week and clean it with the net the rest of the time. Linden trees drop a ton of teeny tiny seed things in addition to leaves, but they aren’t difficult to scoop out before I settle into my floaty paradise. Even bugs aren’t a problem. They mostly stay on top and come right out with the leaves. For two summers, I enjoyed floating in the shady coolness in my inflatable chair, a can of Arizona Green Tea stuck in the drink holder, or attempting to swim a little (the water only comes up to my thighs). I anticipated just such a relaxing time this year, and as soon as the weather warmed, up went the pool. And then, they came. The starlings. They like water. I knew this, but I didn’t know why. Now I do. They use my sparkling watery paradise as a toilet. They perch on the edge and blast their white, black and purple bombs right into my lovely, lovely pool. Evil poop machine from the bowels of Hell. I’ve swum in lakes, oceans, creeks and ponds. You expect a bit of poo in there. After all, living creatures use these bodies of water as their homes. But pools should not have poo in them. They should be pristine. They aren’t natural. They’re artificial constructs of chlorinated perfection, and bird poo is not welcome. And if you have guests, it’s embarrassing. These birds roost in the mulberry tree next to the pool. Unfortunately, it’s not in my yard, and I can’t cut it down. So I did the next best thing; I bought a cover. That’ll help, right? Missouri. Is. WINDY. It starts in October and doesn’t let up until July, when the weather turns to hot, humid hell. Gasping, sweaty people flock to the city pools and their backyard oases, praying for a breeze that never comes. And the wind flutters the tree limbs, blows the linden flotsam across the grass and flips the pool cover right off. So everything on it, linden seeds, leaves, bugs, bird poo, runs right off and into the water. I give up. Seriously. There is no way I can work all day and come home and deal with this disgusting mess. Stop using my pool as a toilet, birds. I’m going to Walmart and buying a BB gun. Gonna shoot into the tree and scare the little bastards away. Gonna buy some shiny Fourth of July streamers and hang them in the tree and freak their little bird minds. I don’t feel one bit sorry for them. I’d hire a bird removal company, but I can only pay them in cookies right now. If you have any suggestions or a bird story of your own, please feel free to share in the comments. PLEASE. I’m taking applications for bird hitmen. I’m paying in chocolate chip and molasses drops this week. After I finished Rose’s Hostage, the novel I’m querying now, I realized a couple of things. First, that the story wasn’t done, at least not in terms of the couple, Joshua and Libby. Where are they going from here? I don’t want to spoil it, but there’s more to come. Second, that my detective has more potential than I thought. Pierce and his partner Rossberger can have more adventures. They live and work in a great big city, and everyone knows great big cities are full of crime. I could have a series on my hands. Creating a series character is a daunting task. You have to give a character room to grow over the course of the series. In addition, each situation must give your character fresh challenges. And he should have the skills, the talents and the knowledge to overcome them. A few endearing or astonishing quirks don’t hurt. I’ve been reading thrillers because it’s the genre I want to work in, and I enjoy them. Writing them is more fun than I ever imagined. I’ve noticed that no matter how over the top you get, you can’t possibly go too far. Ever. Look at Dan Brown’s Robert Langdon series. In Angels and Demons, Robert Langdon has to jump out of a helicopter and float down to earth using a makeshift parachute. In The Lost Symbol, he gets kidnapped, buried alive, and appears to die. Michael Palmer’s medical thrillers get equally crazy. I can’t remember which one it was, but the villain trapped the protagonists in a cave filling with water and in a desperate attempt to save themselves and others trapped with them, they had to swim out through a tiny hole. My poor detectives might have to stretch themselves. I strove for realism in the book, which, after re-reading some of this other stuff, makes me wonder if it’s too sedate. In real life, cop stuff usually isn’t that exciting. My absolute favorite, by the authors other than Stephen King who would inspire a Wayne’s World-type salaam from me, is Douglas Preston and Lincoln Child‘s Aloysius Pendergast series. These two write terrific thrillers independently, but their collaboration boasts the best character I’ve come across in years. Pendergast is an FBI special agent unlike any you’ve ever seen before. The man is filthy rich, impeccably dressed, cultured but not snobbish (although he has moments of condescension that somehow manage not to sully him), pale, cadaverous and spooky. He is the kind of person to whom weird things gravitate. An unexpected ward born in the nineteenth century, an evil brother (not a twin, thank God), various monstrous cases. With real monsters. Pendergast can have a quiet cup of imported tea with you and in the next two seconds disarm a crazed assassin. He picks locks, is a master of disguise, and frequently operates outside the bounds of the law, all while maintaining a unique propriety. He started in Relic as a peripheral character; the real protagonist in that one is NYPD Lieutenant Vincent D’Agosta. Vinnie ends up as Pendergast’s sidekick in the series, heavily involved in his many outrageous adventures, to the disgust of his captain and new lover, Laura Hayward. I always feel when reading that first book that the authors liked the character so much that they ran with him. And the results are not disappointing. In their latest, Fever Dream, Pendergast, along with Vinnie, must solve the mystery of his wife’s murder. You don’t see Helen in the series until now; she’s already dead. Most thrillers rely on suspense to move the story forward. You might already know who the antagonist is, and the momentum lies in the hero’s attempts to thwart him/her, or resolve a situation that seems insurmountable. For example, will Cowboy Sam be able to free Pearlie Sue, tied to the railroad tracks by Mad Marvin, before the 5:15 arrives? Fever Dream contains a genuine mystery, and the stakes are tremendously high. Worse, it leaves bits hanging at the end. Boo! Now I have to wait until the next one. It’s torture, I tell you! Sheer torture! I also liked this book because Pendergast comes unglued. Every one of us has a breaking point. For him, it’s the discovery that the one person he allowed into his cloistered emotional world was actually murdered. Pendergast’s early life was not exactly a stereotype of comfortable wealthy leisure. (Evil brother, remember?) Usually, this character is an ice cube. Here, you get to see another side of him. And it ain’t pretty. A strong character needs to have facets. He’s not believable unless he does. No one acts/feels/thinks one way all the time, and neither should a book character. In a series, these facets are great ways to advance not only the character development, but the story arc. Do you have something in mind for your hero? Does he strive for a goal like Harry Potter’s revenge against Voldemort for killing his parents, or Roland Deschain’s quest for the Dark Tower? Reaching that goal will likely end your series. Yet the journey can wring your character out like a rag. No fun if it doesn’t, for reader or writer. Or you can leave it open-ended, but explore different aspects of the character. Preston and Child let us into Pendergast’s traumatic past in the Diogenes trilogy, in which Pendergast must confront his brother. Theoretically, they could milk his complex psyche until they die. In the back of Fever Dream, the authors announced the coming debut of a new character, but that they would not abandon Pendergast. That’s great, because we Pendergast fans can’t get enough. Unless he started doing ridiculously out-of-character things, I’d certainly keep buying the books, and I don’t even wait for paperback anymore. The key to keeping a series character alive is love, I think. You have to love putting this person through his paces. You must love spending time in his world. I love Detective Pierce. He’s a bit prickly, not exaggeratedly so, but a good man overall, trying to do the right thing. I can’t wait to see what tips the scales for him, or how he deals with the myriad nightmares I can throw at him. I’ll give it a shot. Or maybe the bad guys will. Today I was reading Chuck Sambuchino’s blog Guide to Literary Agents and came across this column, part of a series about writers at all stages of their careers sharing their tidbits of wisdom and knowledge. Lara Ehrlich is as yet unpublished, but her advice rings true. Check out her blog; it’s kinda neat. She says you don’t know in the earliest stages of a manuscript how it will turn out. It could be completely different from what you share. I concur and expand: early feedback, if positive, could lock you into a path that wouldn’t necessarily serve the story. You must have the freedom to be flexible without outside influence dictating your narrative. If they like the story, the premise or a character, people will bug you incessantly until you produce it. I made that mistake with my work-in-progress. Now people I know are asking about it at intervals, making me feel pressured. It doesn’t help because the story is in a structural tangle and I’m trying to work it out. It’s my own fault. I’ll never do that again. Here’s my opportunity to explore ways to deal with deadline stress. Always learn something from your stupid mistakes! You can’t copyright ideas. As far as I’m aware, you can’t prevent someone from taking a vague suggestion you elaborated on over a beer, in a chat room / forum or even your critique group and running with it. The only thing you can sue for is if someone steals your written, fixed and tangible work. So I could say “I’d like to write a story about a living airplane that eats pollution” and someone could write it, and there’s nothing I can do. If I actually write the story, published or not, and then someone steals it, there could be trouble. Feel free to play with that one, if you like. If you come up with a living airplane story that actually works, send me a link to it. I’d love to read that! Writers worry all the time about people stealing their ideas. Although I haven’t seen it, there was even a kid’s movie about this, Big Fat Liar, with Frankie Muniz, Paul Giamatti and Amanda Bynes, where a smarmy Hollywood producer steals a brilliant homework assignment from an incorrigible kid. Despite the movie, most of the time you don’t have to worry about this. Reputable agents and publishers know that they won’t be in business long if they go around swiping every unpublished manuscript that isn’t screwed to the brick wall of copyright registration. Under the law, once it’s in a tangible form, it’s yours. If you want to sue, you’d have to register it formally, but that’s usually taken care of by your publisher if you’re fortunate enough to land one. If you back up digital work regularly it’s easy to show when a file was created. Just don’t talk about your embryonic nuggets of literary gold, and no one can take them from you. Keep your big mouth shut. Don’t share those first attempts, either, as Lara advises. No one can implode your ethereal house of cards if they don’t see it. Keep it close until it’s strong enough to withstand a poke or two. Sometimes it’s better just to walk away, but a truly good story may be lost if the writer folds because of an early question or criticism. Got any advice about sharing/not sharing? Please post in the comments.